1. In large mixing bowl, beat egg slightly. Add next 6 ingredients. Mix well. Add ground beef. Mix until combined. Portion meat mixture using level tablespoon. Shape into meatballs. Place in single layer in shallow baking pan coated with cooking spray or foil lined. 2. Bake at 400°F about 12 minutes or until well browned. 3. For sauce, measure remaining ingredients into 3-quart saucepan. Stir to combine. Cover. Simmer over low heat about 15 minutes, stirring frequently. Add meatballs to sauce. Simmer over low heat about 10 minutes longer. Serve over rice, if desired. 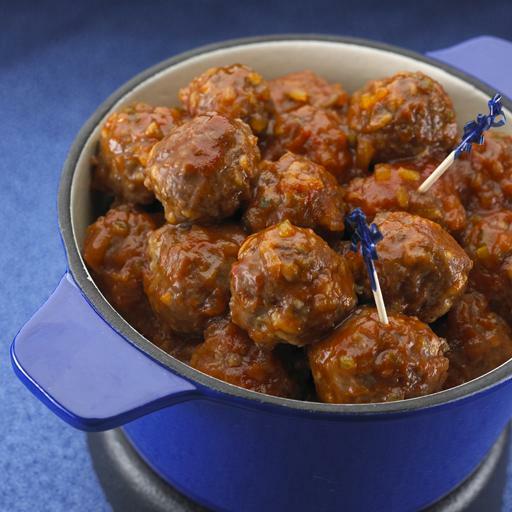 NOTE: As an appetizer, serving size: 1 meatball and recipe makes 18 servings. This Spicy Meatball recipe is from the Kellogg Kitchens Recipes Cookbook. Download this Cookbook today.